Getting a female duck to foster ducklings who aren't her own isn't a difficult task. In some species of ducks, it's a common practice, technically known as conspecific parasitism. Ducklings need a foster parent who can teach them species-specific skills. If you want a female duck for sitting on the fertilized eggs of another duck, a Muscovy is your best choice. They are the broodiest of all domestic duck breeds. You can simply slip the eggs into the nest if the duck is already brooding a clutch. She should raise the foster ducklings as her own. If you have another breed of duck that's currently broody, you can place the eggs in her nest. However, the University of Wisconsin Cooperative Extension website points out that "Most domestic waterfowl lack the instinct to incubate or brood eggs properly." If you find orphaned wild ducklings, it's important that they have a duck surrogate parent. That's because ducklings imprint quickly. If hand-raised, a duckling might think he's a person, rather than a duck. If you've got a friendly, nurturing dog, the ducklings might believe they are canines. For best results, place the ducklings in a safe, warm environment but limit their contact with people and other domestic animals as much as possible until you find a surrogate mother. Try to find a foster mother with ducklings about the same size as the babies in need. If fostering domestic ducklings, you might be able to find a duck of the same species. While domestic ducks will foster wild ducklings, the reverse isn't usually true. 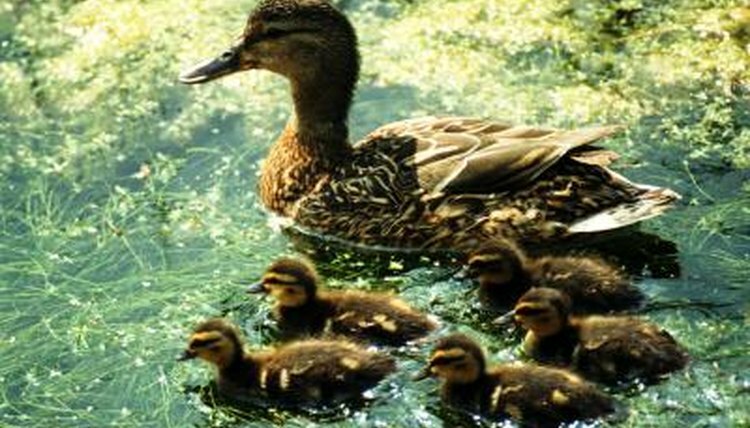 Any scent of humans will cause wild ducks to reject ducklings, wild or domestic. While you can add one or two foster ducklings to the brood of a domestic duck, if you have large numbers of ducklings you should split them between foster moms. After introducing the new ducklings, watch carefully to see if they follow the other ducklings and if the mother accepts them. In most cases, it's not a problem. If you can't find a female duck to foster ducklings, a drake -- or male duck -- might serve in a pinch. The Humane Society of the United States website reports that a male Indian runner duck took on the responsibility for 10 mallard orphans. Although a female duck is preferable, the HSUS' experience proves that suitable drakes can foster ducklings, teaching them important skills and allowing them to imprint on their own species.